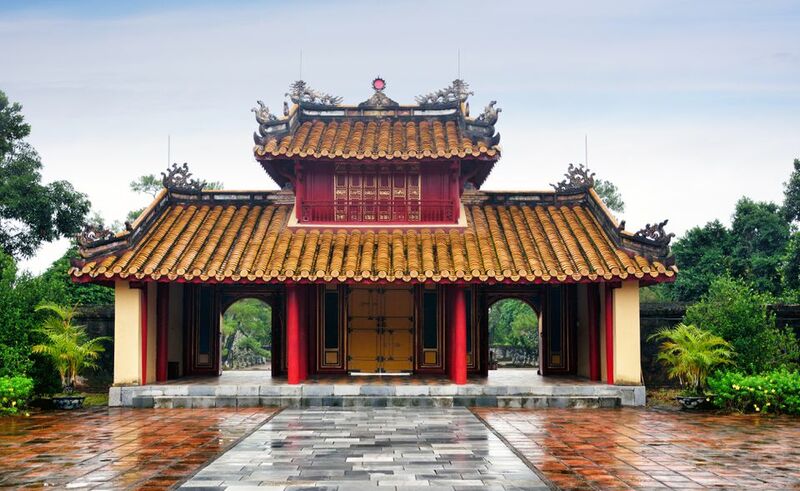 The Minh Mang Royal Tomb in Hue, Vietnam, is the final resting place of one of the Nguyen Dynasty’s staunchest Confucians, whose reign represents the apex of Nguyen power over the country. When compared to other royal tombs in Hue, this tomb’s design represents a middle way between Tu Duc’s and Khai Dinh’s – lacking the sprawling size of the former, yet far more refined than the latter, the Minh Mang tomb nonetheless offers a balance of landscaping and architecture that is unmatched among the tombs in Hue. Every building, every hillock, works in conjunction with the composition of the whole: If the tomb speaks for the Emperor buried within it, we see the representation of an Emperor who sought balance in his reign, ruling his subjects with a firm but fair grip, but rejecting overtures from foreign nations (Minh Mang was selected for his aversion to Christian missionary activity, among other things). Emperor Minh Mang reigned from 1820 to 1840. Construction on his tomb began on the year of his reign, but it was still incomplete upon his death. It fell to his son and successor Thieu Tri to complete his final resting place, with the help of about ten thousand workers and artisans. The whole arrangement is surrounded by reflective ponds fringed with pine trees. 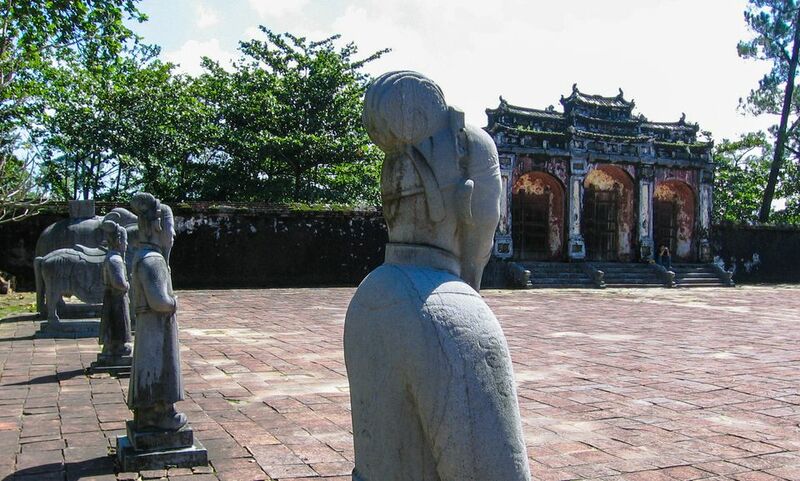 Vehicles visiting Minh Mang’s Royal Tomb are required to stop at a parking lot/rest stop at the entrance, forcing visitors to walk about 500 yards on a dirt path to reach the first stop: Dai Hong Mon Gate. Dai Hong Mon is a gate with three openings; the center gate was opened only once, to admit the body of the Emperor. After the Emperor’s burial, the gate was closed for good. Visitors must enter through the two side gates, which were for the use of mandarins and other members of the royal family. Dai Hong Mon represents the easternmost point of a straight axis that lines up the structures in the Minh Mang Tomb. The next point following Dai Hong Mon is the forecourt, or Honor Courtyard, with its traditional double row of mandarins, elephants, and horses. From the forecourt, visitors may ascend one of three granite staircases that lead up to the square Stele Pavilion, or Bi Dinh. Once nearby, but now gone: A sacrificial altar where livestock was killed for the sake of the Emperor’s soul. The Stele Pavilion contains the Thanh Duc Than Cong stele, inscribed with a biography of the Emperor written by his successor Thieu Tri. Past a series of courtyards after the stele pavilion, you’ll find Hien Duc Gate guarding access to Sung An Temple, where the memory of the Emperor and his Empress Ta Thien Nhan are worshipped. Sung An’s courtyards are flanked by Left and Right Temples in the front and Left and Right Rooms behind. From Sung An, three bridges crossing the Lake of Impeccable Clarity (Trung Minh Ho) and another gate (Hoang Trach Mon) lead to the Bright Pavilion (Minh Lau), a square ​two-story pavilion with eight roofs. Two obelisks flank Minh Lau Pavilion, a representation of the Emperor’s power. The Pavilion sits atop three terraces that represent three powers in the world: Earth, water, and heaven itself. Two flower gardens behind Minh Lau create an arrangement of flowers in the shape of the Chinese character signifying longevity. Another stone bridge crosses the crescent-shaped Lake of the New Moon (Tan Nguyet), bridging the path to a huge staircase with sinuous dragon banisters. The staircase leads to a circular wall enclosing the sepulcher. A locked bronze door bars access to the emperor’s burial site: an artificial hill planted through with pines and brush. Getting to Minh Mang’s tomb: The site is seven miles from Hue and is served by package tours, xe om, and cyclo drivers from the town center. Must haves: Parasol, sunglasses, and a bottle of water in the sunny season during April-September, and an umbrella and raincoat/jacket during the rainy months of October-March. Wear comfortable shoes – there’s a considerable amount of ground to cover on foot.